Information on Cockapoos we strive to provide all the information you need about Cockapoos. Cockapoos vary in size and color. Both size and color are determined genetically from both of its parents and their recent heritage. Cockapoos will show strong character of both parents, but they definitely show both parents in a unique way that gives Cockapoos a special look. Our Cockapoo puppies are CKC registered. Cockapoos have little to no shedding. Their temperament is loving, they are very intelligent and alert, yet with a sweet nature, they are famous for being wonderfully affectionate pets. Cockapoos have a sturdy build, are eager to please and easy to train, and non-destructive. Cockapoos are idea companion pets. They are very smart, loyal, mellow, are good with children of all ages and with other dogs and cats. The puppies personalities is not developed in the 7 -8 weeks they are here with us. The new family will develop the personality of their new puppy with consistent training, love and socialization. However, your new puppy will go home with a sweet, happy and loving spirit with plenty of puppy kisses for you. It is your responsibility as their new master to train them, socoalize them and love them. In return, the bond will be remarkable and your new puppy will mature to a dog that everyone will want to take home! Cockapoos make wonderful pets, are healthy and easy to maintain and care for. They have a long life span and the average is 14-18 years and some may live up to 20 years. Cockapoos adapt well to families, seniors and smaller living spaces. They require no special grooming other than the usually brushing once a week and a little care of the eyes and ears. If unclipped they take on a "Benji" appearance. The adult Cockapoos mature to 10-18 lbs grown depending on the size of the parents. For people wanting a low to no odor, low shedding, highly intelligent pet that is easy to maintain, train, you will love a cockapoo. A Cockapoo is a good choice for people that has allergies, the ideal dog is a Cockapoo. Please browse our website, which is full of information that will be useful for you when you bring home your new puppy. Please check our Available Puppies page to see if we have any Cockapoo Puppies available. If we are sold out please bookmark our web site and kept checking back. We do keep our web site up to date. 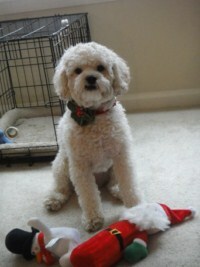 We are excited to begin sharing our adorable Maltipoos with loving homes. Looking for a Maltipoo? Please visit our Maltipoo web site at www.sherrysmaltipoos.com page to see when we are expecting a litter of Maltipoo Puppies and more information about the maltipoo breed. What is the differences in a Cockapoo and Maltipoo? Cockapoos have little to no shedding. Their temperament is loving, they are very intelligent and alert, yet with a sweet nature, they are famous for being wonderfully affectionate pets. Cockapoos have a sturdy build, are eager to please and easy to train, and non-destructive.Cockapoos are idea companion pets they make a wonderful family pet. They are very smart, loyal, mellow, are good with children of all ages and with other dogs and cats. We recommend cockapoos for families that have small children. Cockapoos adapt well to families, seniors and smaller living spaces. They require no special grooming other than the usually brushing once a week and a little care of the eyes and ears. If unclipped they take on a "Benji" appearance. The adult Cockapoos mature to 10-18 lbs grown depending on the size of the parents.Cockapoos are inside or outside dogs. For people wanting a low to no odor, low shedding, highly intelligent pet that is easy to maintain, train, you will love a cockapoo. A Cockapoo is a good choice for people that has allergies, the ideal dog is a Cockapoo. Maltipoos are non-shedding, are very affectionate, loyal, very playful, love to cuddle and easy to trained they also get along well with dogs and other pets if socialized when young. Maltipoos may be wary of strangers and are highly protective of their family. Maltipoos get along very well with children, but should be supervised around young children to ensure they are treated respectfully.The smaller maltipoos around 6 lbs are usually fragile and I do not recommend them for families with small children,therefore they would be better for families with older children.The larger maltipoos around 8-12 lbs I would recommend them for families that have small children.If you are looking for a lap dog and suffer from allergies you will love a Maltipoo they make wonderful little lap dogs and love to cuddle for hours and will still your heart. They have the cutest little baby face adorable little puppies and a highly intelligent pet. Maltipoos get along very well with children, but should be supervised around young children to ensure they are treated respectfully. Feel free to e-mail us or call Amanda at 229-457-4568 if you have any questions. We will be glad to answer them. I hope you will enjoy our web site and thanks for stopping and looking at our site.